At left, Professor Wolfgang Bottenberg shakes hands with Henryk Górecki. At right, Górecki receives his honorary doctorate from Chancellor Eric Molson. A warmly appreciative audience welcomed Polish composer Henryk Górecki to the Concordia Concert Hall on November 20, where he gave an endearing interview and watched a performance of music by himself and his son. Górecki was awarded an honorary degree by the University earlier in the day. He and his son, Mikolaj, a 27-year-old composer who once studied at the Banff School of Fine Arts in Alberta, were in town for about a week, and attended another performance of their music the day after Convocation at St. Leon Church in Westmount. Eva Monczak, one of the organizers of his visit, said it took two years for her husband, violinist Mariusz Monczak, to convince Górecki to visit Montreal. "He kept saying he doesn't like to travel," Eva said. "He didn't want to come just for the flowers. But we made it convenient for him, picking the fall because he won't travel in winter, spring or summer." She added, "He's very natural and emotional, and doesn't hide anything. He's capable of great warmth. But no one can force him to do anything he doesn't want to do." Retired Music Professor Wolfgang Bottenberg opened the interview portion of the evening, which was conducted in Polish and German and then translated into English, by saying that while he would like to have conversations with Bach and other composers about their music, he unfortunately can't. "But tonight, I have the chance to converse with one of the greats," he said. Bottenberg asked Górecki about the religious influence in his work. "I often ask myself what profound music is," Górecki replied. "Is a profound Schubert piece less sacred than the Kyrie from my own mass? When Rossini writes religious music, it's still opera. It doesn't just depend on the titles of the works." Górecki, true to his reputation of being a modest and earthy man, also displayed a good sense of humour. When asked when he will write his fourth symphony, he said, "I first have to write the fifth and the ninth, then I will go back and do the fourth and sixth." He gained fame worldwide with his Symphony No. 3 (Symphony of Sorrowful Songs) in 1989, but he has written more than 150 works before and since. Bottenberg asked Górecki on behalf of an audience member whether there is anything more beautiful than music. Górecki said, "Yes. We don't have to look far; there's nothing more beautiful than what is around us: life. We have to direct our senses to the good things in life, not the bad. This is my philosophy of music." He added that sometimes it is harder to make a beautiful table or chair than a piece of music, but checked himself. "Well, maybe I'm going too far!" Then, summoning the end of the interview, Górecki said, "Speaking of music, shouldn't we let the musicians play?" And play they did. The energetic Penderecki Quartet, from Kitchener, performed Górecki's String Quartet No. 2(Quasi una Fantasia, 1991) with style and emotion, making it a joy to watch. Dedicated to California's Kronos Quartet, the piece combines slow, pulsing beats with themes influenced by the folk tradition. Concordia Music Professors Liselyn Adams, flute, and Louise Samson, piano, performed For You Ann-Lill, op. 58 (1986-90), a minimalist, bitonal piece he finalized for Danish flautist Ann-Lill Ree. Local musicians Mariusz Monczak, violin, and Irina Vorobieva, piano, gallantly gave Little Fantasia, op. 73 (1997) its Canadian debut. Also a first was a recent work by Górecki's son, Six Bagatelles, for piano, violin and cello. Feisty Françoise Gadbois tackled the piano, while Monczak and Gordon Cleland played violin and cello, respectively. 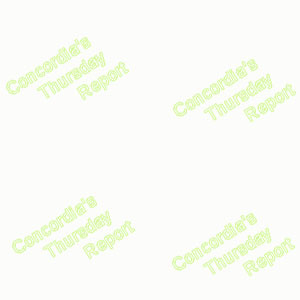 Copyright 1998 Concordia's Thursday Report.